Where does your clothing really go? Starting with a rush of food drives around Thanksgiving and Halloween, this time of year — the giving season — brings an increase of donations of clothing, money, food and other goods. Thrift and second-hand stores benefit largely from clothing donations. According to a study done by Kijiji, 85 per cent of Canadians interacted with the second-hand industry by either donating, trading, purchasing or selling clothing in 2016, and 62 per cent of second-hand goods came from donations. For people like Joe Deal, thrifting has become a way of life. Deal buys most of his clothes from thrift stores and donates what he doesn’t use. “My big thing is just to give back. I know it may only be a T-shirt, a pair of jeans, a hat to keep them warm, but it’s just a little thing I can do,” says Deal. Kate Bahen, managing director for Charity Intelligence Canada, a not-for-profit that rates and reviews other charities, says it’s all about doing research. This way, she says, people can make sure donations end up where they wanted them to. She says to ask yourself: is the thrift store for profit, is it a registered charity and are they asking for goods in kind or paying you? Charities must be registered with the Canadian Revenue Agency, allowing them to give tax receipts. As a not-for-profit, any money they make must go back to the charity. There are many places to donate to across the Halifax Regional Municipality. The Signal looked at five to see how different operations handle your donated goods. The Salvation Army, a Christian not-for-profit charity, operates six thrift stores across the HRM for clothing, textiles, housewares and furniture. Donors can drop off goods at each of these stores. 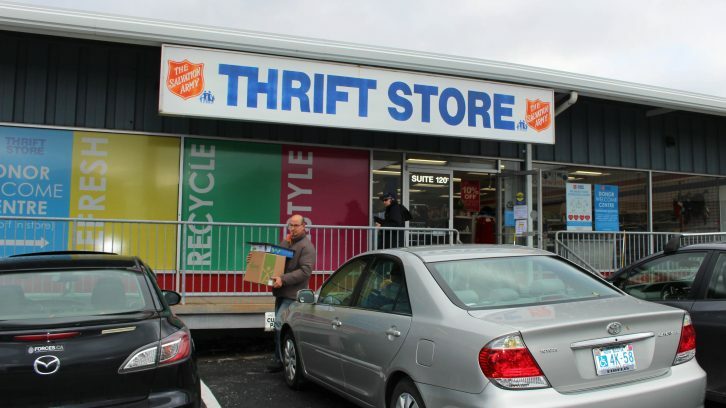 Julie Buchanan, retail district manager for Salvation Army in Nova Scotia, says proceeds from their thrift stores are used to support the Salvation Army’s operating costs, as well as their charitable initiatives including shelters, food banks and emergency aid. She says money raised in Nova Scotia stays in Nova Scotia. “It’s from our community, for our community,” she says. The Salvation Army’s website, says when pricing donations, it considers factors such as quality, condition and brand names. It says any unsold textiles are recycled through “ethical” recycling programs to avoid waste, and estimates less than five per cent of donated textiles end up in landfills. The Salvation Army also has a voucher program that allows people in need to shop at their thrift stores free of charge. Diabetes Canada, a charity, doesn’t operate its own thrift stores. Instead, it uses drop-off boxes and a door-to-door pickup service. 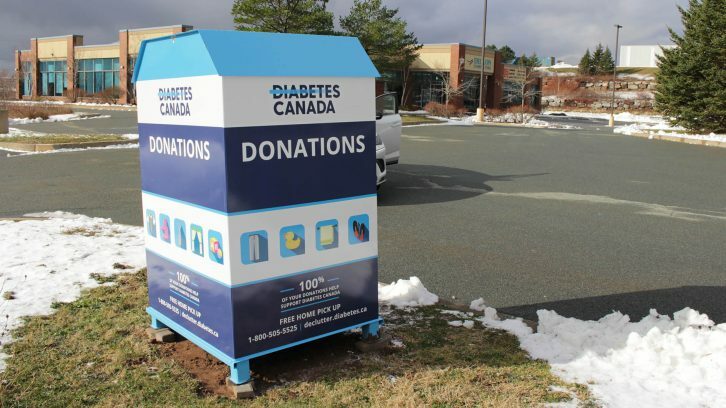 Donation boxes are often found in front of Diabetes Canada’s various partner organizations’ retail stores, including Canadian Tire, Sobeys and Needs Convenience stores. Their door-to-door pickup service allows donors to arrange pickup times online or by phone. After booking, Diabetes Canada will send a crew to collect donations from people’s doorsteps. 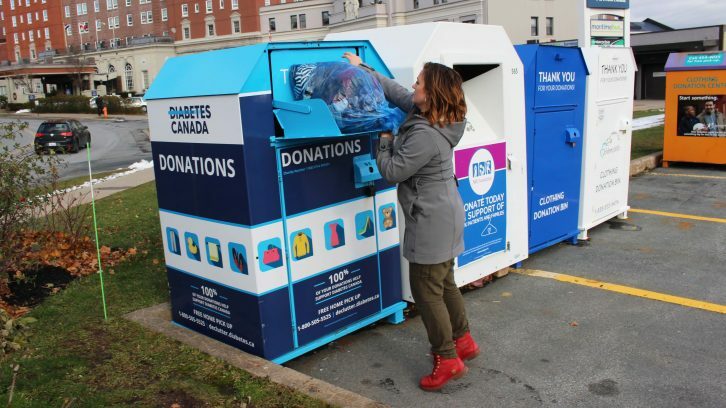 Diabetes Canada doesn’t deal with its donated clothing directly. Donations are instead sold to for-profit thrift store Value Village for resale. On its website, Diabetes Canada says it raises $8.7 million annually as a result of the partnership. The website also says revenue is pooled nationally and used to support diabetes research, education, programs, services and advocacy across the country. Value Village is owned by parent company Savers. It operates over 300 locations in Australia, Canada and the U.S, employing 20,000 people. Its website says it has given communities “a smart way to shop” as its Rethink Reuse business model saves 700 million pounds of goods from landfills annually. Aside from Diabetes Canada, Value Village gets its goods from one of 100 non-profit partner organizations or directly from individual donors. 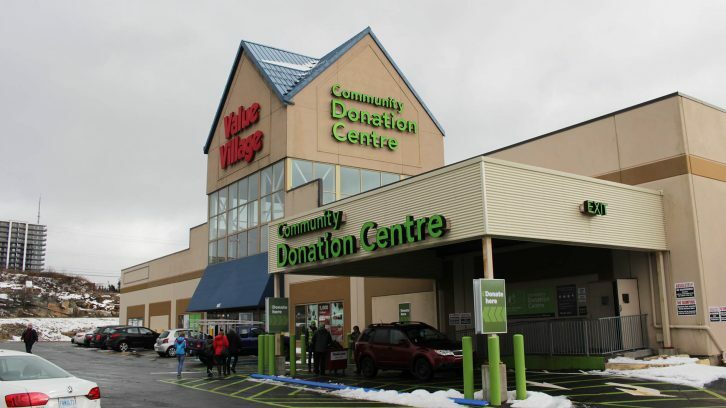 In a statement to The Signal, a spokesperson for Savers says Value Village pays non-profit partners for their items, including clothing dropped off by people at local Value Village stores. Value Village has faced some scrutiny about how it brands itself. In December 2016, a Washington attorney general sued TVI Inc., the parent company of Value Village, claiming, “it used deceptive advertisements and marketing to make people think Value Village is more philanthropic than it actually is,” according to the Seattle Times. The Times also reported Value Village paid almost $13 million to non-profits in Washington state in 2016, and more than $120 million in the last 10. Phoenix Youth Programs is a not-for-profit registered charity that operates support programs for young people throughout the HRM. 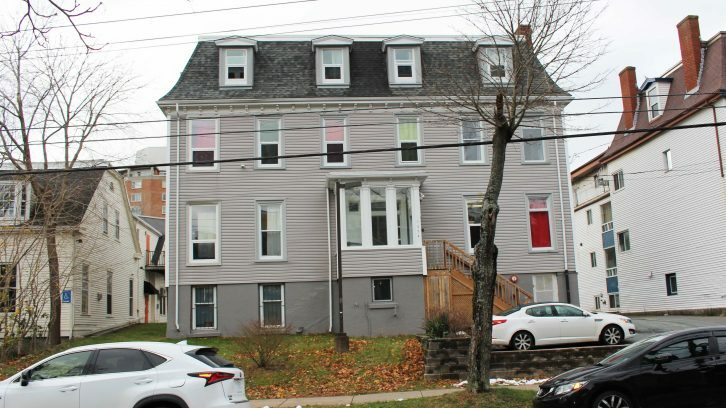 It provides services including housing support, crisis intervention, counselling and health services out of their drop-in centre and youth shelter in Halifax. Phoenix accepts donations of food, gently used clothing, gift cards, bus passes and personal hygiene items at either the centre or the shelter. All donations received are placed in Phoenix’s donation rooms, where clients have access to them, as needed and without limitations. Andy Langille, a caseworker at Phoenix, says they are limited by their space, in terms of what they can accept. Large pieces of furniture and home decor are among items too large for the organization to accept. Langille says Phoenix tries to only accept gently used items, with minimal damage. Langille says Phoenix does not profit from their donations. ReStore is a non-profit building supply and home decor store that accepts donations of building materials and other goods used in homes. 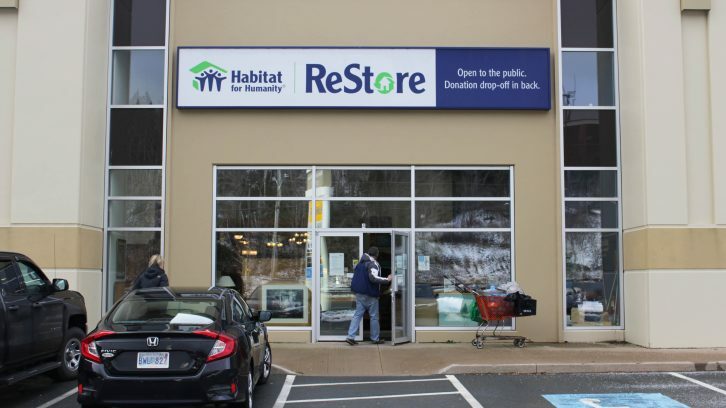 ReStore has two locations, one in Bayers Lake and the other in the Dartmouth Business Park. All proceeds go to Habitat for Humanity projects. Director of fund development, Elizabeth Smith, says some donations are brand new items from retail stores like Rona, Home Depot and Ikea, and others are donations brought into the store by individuals. ReStore’s kitchen removal program has volunteers evaluate kitchen’s people no longer want and decide if they can remove it. Once removed it is brought to the ReStore to be sold. ReStore is primarily run by volunteers. Smith says they “could always use volunteers one way or another,” whether it’s at the store or on active builds. Its website boasts that all items are tax free and are discounted from the retail price. Smith says items that don’t sell quickly get marked down by 40 to 50 per cent. If it still doesn’t sell, the item gets donated to one of the store’s partners to be used in another way. Correction: Nov. 22, 2018: An earlier version of this story contained an error regarding Value Village’s purchase of donated clothing. It also didn’t correctly identify the parent company as the defendant in the lawsuit. Unconfirmed information about Value Village’s profit from donated textiles was removed.